John Houck, Sibling Rivalry (left), 2018. The Adjacent End (center), 2018. Accumulator #18_01, 3 Colors #006F83, #D6AC93, #234B53, 2018 and Accumulator #18_02, 3 Colors #006F83, #D6AC93, #234B53 (right), 2018. John Houck’s photographs are an amalgam of folds, creases, grids, and painted passages, all layered to collage-like effect. Each photograph is the result of a process whereby the artist composes, layers, photographs, prints, and re-photographs numerous times, intentionally leaving the seams and edges visible. While his work addresses some of the intrinsic characteristics of photography—the manipulation of light and shadow, varying or skewed perspectives, optics and the illusion of depth—he is also invested in photography’s unique ability to conjure the past, reminding us of the ways in which photographs are useful tools for remembering, exploring, and understanding our complex inner lives. 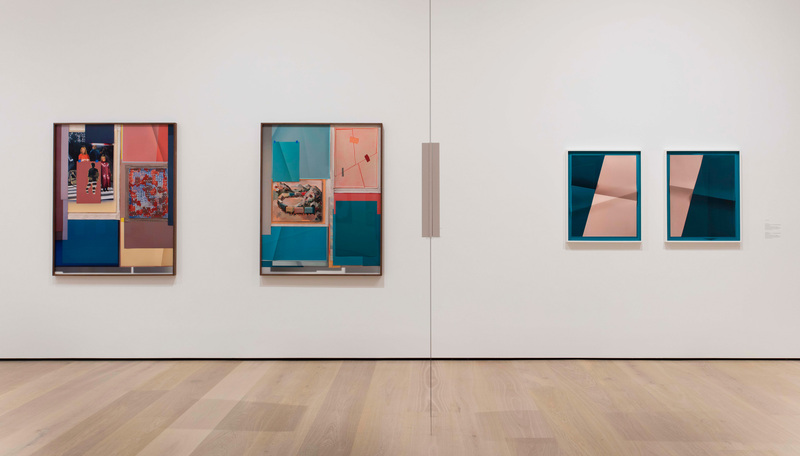 Three photographs from Houck’s Playing and Reality series are included in Made in L.A. 2018, and each features an array of imagery—from discrete paintings to collaged colored papers that are folded or creased and layered within the print. This body of work grew out of Houck’s interest in relational psychoanalysis, particularly the psychoanalytic process of self-examination. A number of Houck’s early photographs repurpose childhood objects given to him by his parents over the years, such as his stamp collection, family heirlooms, and drafting tools. 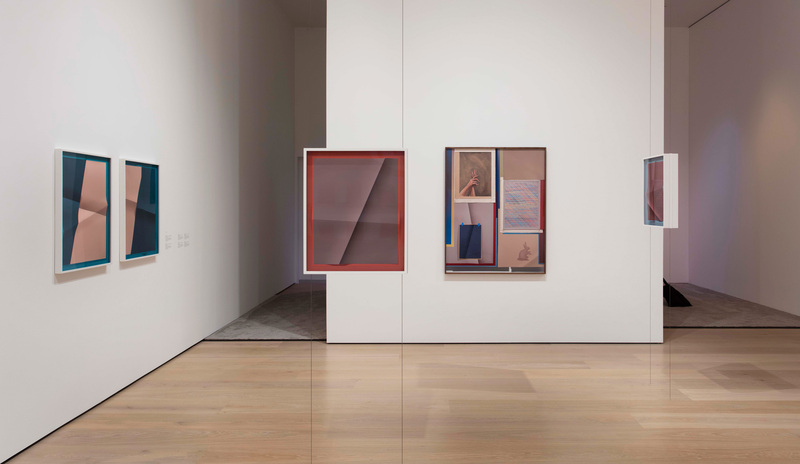 The works on view in Made in L.A. 2018 are a slight departure from these earlier works, incorporating paintings and silkscreens made from memory rather than sentimental objects. The representational paintings included in the photographs are descriptive and open ended, while the grids are much more systematic. This tension articulates Houck’s belief that the act of remembering is objective and precise and associative and imaginative. Alongside photographs from Playing and Reality are two new diptychs from Houck’s ongoing Accumulator series. 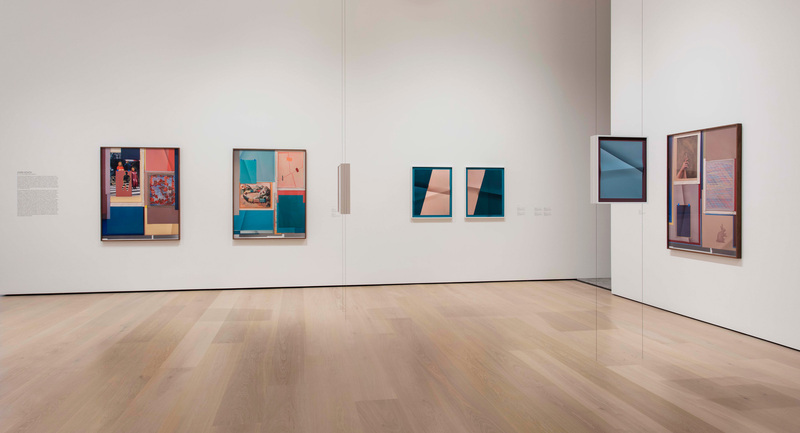 Installed together, these color block prints are exact opposites, hung back-to-back, with a distinct recto and verso, in the center of the gallery. The “feedback loop,” as Houck has described it, created by his process of re-photographing, is interrupted by pronounced folds in the paper, drawing our attention to his interventions and the materiality of the prints. John Houck (b. 1977, Pine Ridge, South Dakota) works in the Atwater Village neighborhood of Los Angeles. Houck received his BA in architecture from University of Colorado Boulder, in 2000, and MFA from University of California, Los Angeles, in 2007. He has also studied at the Whitney Independent Study Program, in 2010, and the Skowhegan School of Painting and Sculpture, in 2008. His work has been exhibited at Dallas Contemporary (2017); The Mistake Room, Los Angeles (2017); International Center of Photography, New York (2016); Museum of Modern Art, New York (2015); Museo de Arte Moderno de Medellín, Colombia (2015); Museum of Contemporary Canadian Art, Toronto (2015); Jewish Museum, New York (2015); Los Angeles County Museum of Art (2014); Palm Springs Art Museum, California (2014), and others. He is the recipient of the National Endowment for the Arts Anderson Ranch Residency (2008).